Adobe Photoshop Lightroom can create some of the slickest slideshows in the west. They’re easy to make and incredibly handy for showing off cream-of-the-crop shots at home, at the local photography club, or for using as a digital portfolio. In this column, you’ll learn to create a slideshow that you export and then sync to your iPhone or iPad. Slideshows have a couple advantages over just handing someone your iPhone to flip through your Photos app: You can add captions so they know what they’re looking at, and a slideshow has an end point, so they won’t keep swiping into images you might not want them to see. Read on! 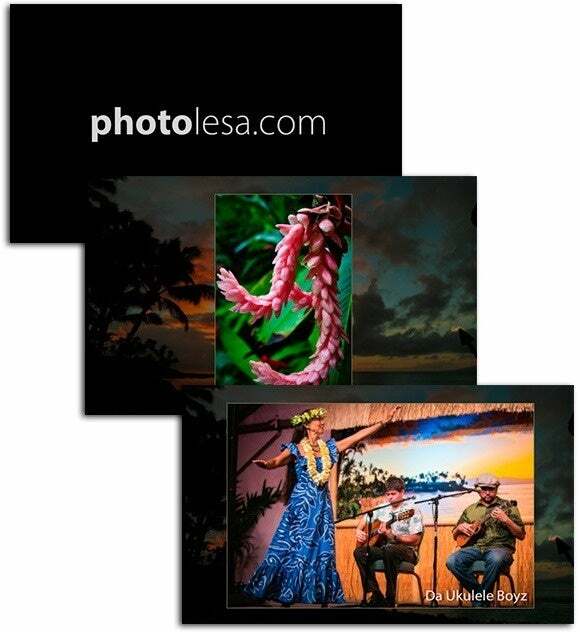 The first step in making a slideshow is to corral photos into a collection (think album). 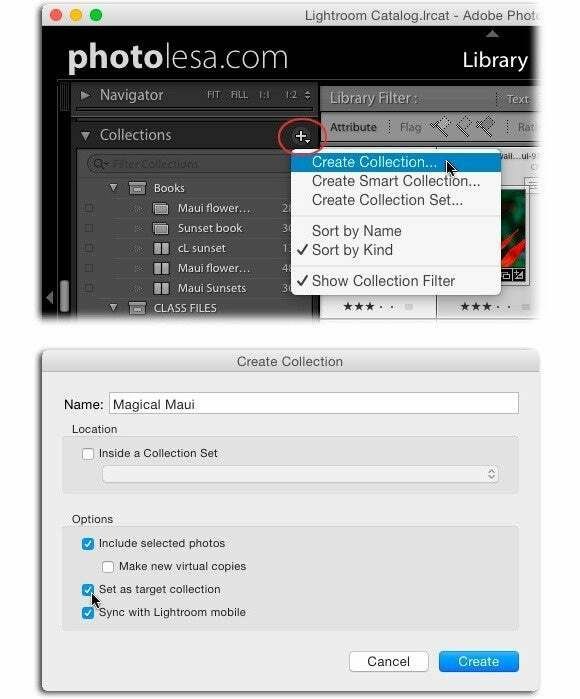 To do it, open the Library module in Grid view by pressing G (or click Library at the top of the Lightroom workspace). Use the Folders or Collections panel at left to locate photos for your show. Select some thumbnails and then in the Collections panel at left, click the + sign and choose Create Collection from the menu that appears. In the resulting dialog box, give the collection a name, turn on “Set as target collection” and then click Create. If the images you want to use live in different folders or collections, start by creating a new collection for the slideshow (top). Turn on “Set as Target Collection” (bottom) so you can quickly add other images to the collection using a keyboard shortcut. Use the Folders or Collections panels to locate other images for your show and add them to the target collection by pointing your mouse at a thumbnail and clicking the circle that appears at the upper-right. Alternatively, just select a few thumbnails and tap the B key on your keyboard. When you’re finished, open the collection by clicking its name in the Collections panel. Drag to rearrange the thumbnails into the order in which you want them to play in the show. Next, use the Metadata panel at right to add captions to your images; just select a thumbnail and enter some text into the Caption field. 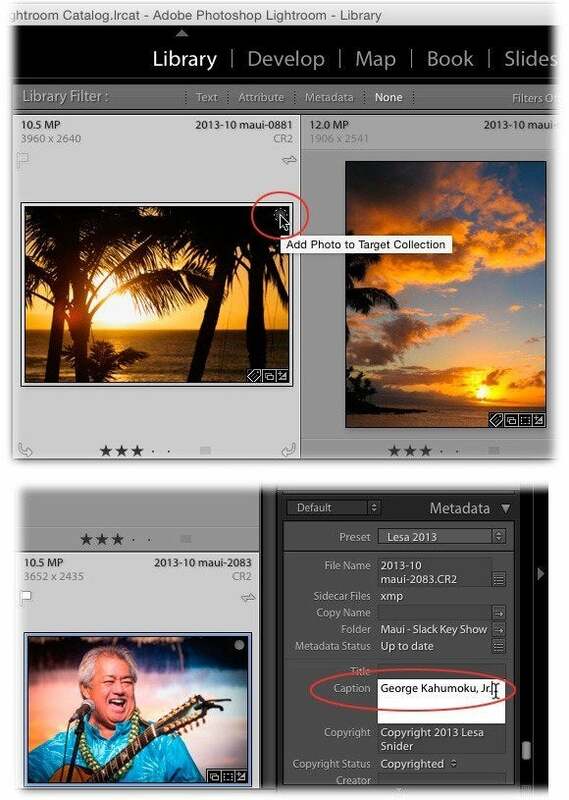 The icon circled here lets you quickly add an image to the target collection (top). 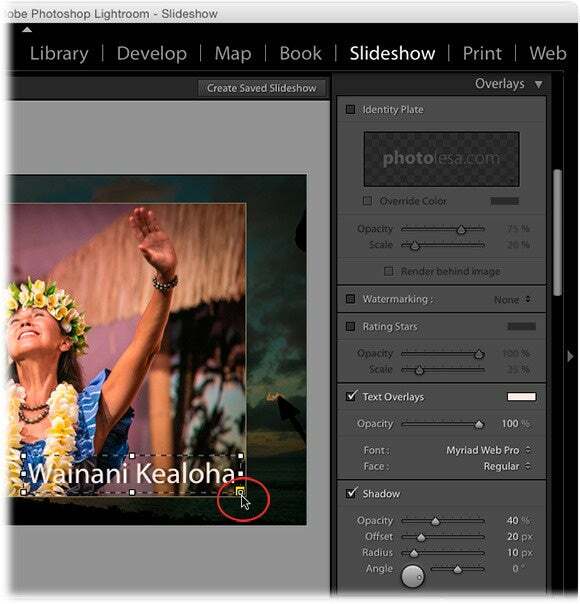 The Metadata panel lets you enter captions that can be utilized by Lightroom’s slideshow module. 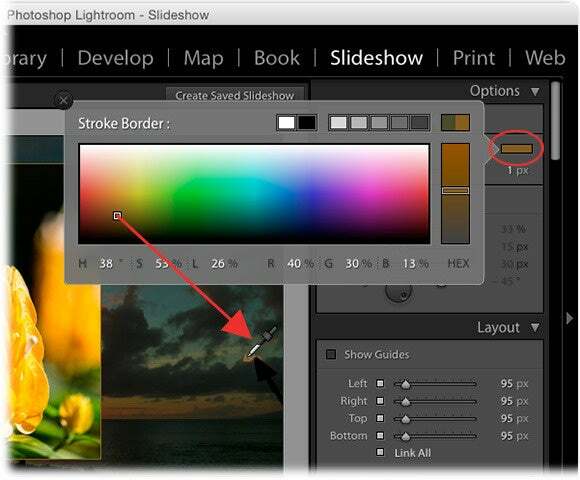 Click Slideshow in Lightroom’s toolbar and a slideshow preview appears. The slides (images) in your show appear as thumbnails in the Filmstrip at the bottom of the window; just click any thumbnail to view that slide. The Template Browser panel at lefthas a few slideshow templates to choose from. However, in this example we’ll use the panels at right to create a custom look that includes a background image. To start, locate the Options panel at upper right and turn off “Zoom to Fill Frame.” Scroll down to the Backdrop panel, turn on Background Image, and turn off Background Color. Drag an image from the Filmstrip into the Backdrop panel, as shown here. To add a background image, just drag it onto the icon shown here. To keep that image from appearing elsewhere in the show—in other words, on top of itself—delete its thumbnail from the Filmstrip. 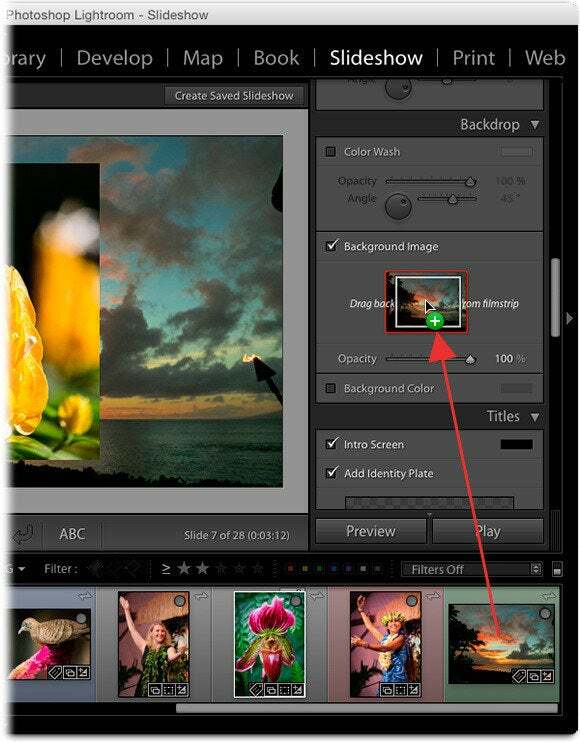 To keep the background image subtle, lower the Opacity setting. Next, scroll up to the Options panel, turn on Stroke Border, and set the width to 1 pixel. Click the colored rectangle to open the color picker and click inside the gradient to choose a color. Click the X at upper left of the color picker to close it. To lift a border color from your image, click and hold within the color picker and then mouse over to a color in your image and release the mouse button to load it. Next, scroll to the Overlays panel and turn on Text Overlays. Click the ABC button beneath the slideshow preview and choose Caption from the menu that appears to its right. To format the text, click it to activate the text box and then use the opacity, font, and face controls in the Overlays panel. To change text size, drag a corner handle on the text box itself. Click and drag the yellowish, square handle (circled here) around the perimeter of the image to set the caption’s anchor point. Here it’s anchored at the lower-right. Now let’s create an opening and closing slide for branding. Scroll to the Titles panel and turn on Intro Screen, Add Identity Plate, Ending Screen, and Add Identity Plate. Click the down-pointing triangles that appear in the identity plate preview to pick the plate you want to use and then use the Scale slider to adjust its size. Last but not least, use the Music panel to add music to your show (royalty- or license-free music only) and then use the Playback panel to adjust slide length, transitions, looping, and so on. Below you can see a couple of screenshots from the final result of this example. The title screen is shown at the upper-left, and repeated as an ending screen at the end of the show. Be sure to experiment with all the formatting controls to create a design that’s uniquely your own, and then use the Template Browser panel at left to save it as a preset (just click the + icon and then give the template a name). When your show is all set, click Create Saved Slideshow at the upper-right of the preview area to save the show in the Collections panel in the Library module. Next, click Export Video at the lower-left of the workspace. In the resulting dialog box, enter a name, pick a location, and then choose a video size from the Video Preset menu, and click Export. Fire up iTunes and choose File > Add to Library. In the resulting dialog box, locate the video you just exported and click Open. Connect your iPhone or iPad and click its icon toward the upper-left of the iTunes window. In the list that appears at left, click Movies and then turn on Sync Movies. Turn on the checkboxes of the videos you want to sync and then click Sync. On your iOS device, the video appears in the Home Videos section of the Videos app. From this point on, your slideshow travels with you wherever you go. Until the next time, may the force be with you all!